Boasting more glass than solid walls, with slightly under 24 feet across; covered two main design challenges: Maximize on exterior views and second explode light on their space. This Ottawa couple also boasts two children toddle and new born ages, In this two-storey home. No more SAD Winters for this happy family. In the kitchen they’ve also utilized Westboro Kitchen. 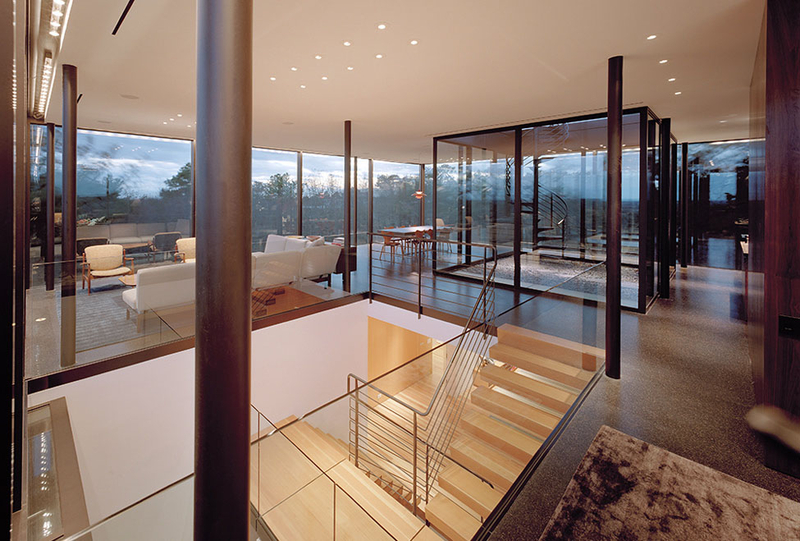 Use glass and detailed lighting supporting their prized possessions and removing barriers with glass stairs. The home is has traces of chunk and slab glass adding to the illusions of larger space and exterior utlization indoors. Remember, this house in in Ottawa where Winters are frigid and cold without many sunny days—why NOT use more glass! Also, always keep yourself updated with guidelines for your local building codes as well, as they’re always changing. You know what they say about people in Glass Houses lol! This is a piece of art manipulated an sculpted into a finely designed HOME—I refuse to even glance at the probably heafty price tag for this lovely abode. However, it is a dream that I will reoccur forever, for me, to live in a glass house. This would be the closest I cud come to actually living in one lol! I love this house—filled with minimal decor, white (don’t really like white much but here it’s ok), with non complicated ceilings and textures thru out, creating a comfortable simplistic flow.